CINCINNATI -- A home team advantage helped the Cincinnati Symphony Orchestra sell its $19.25 million riverfront concert venue plan to members of the Joint Banks Steering Committee Wednesday. Two other competitors — the nation’s largest concert promoter, Live Nation, and the owner of Columbus-based PromoWest — lost out to a joint proposal from the Cincinnati Symphony Orchestra and its music management firm, MEMI, to build a new concert facility at The Banks. 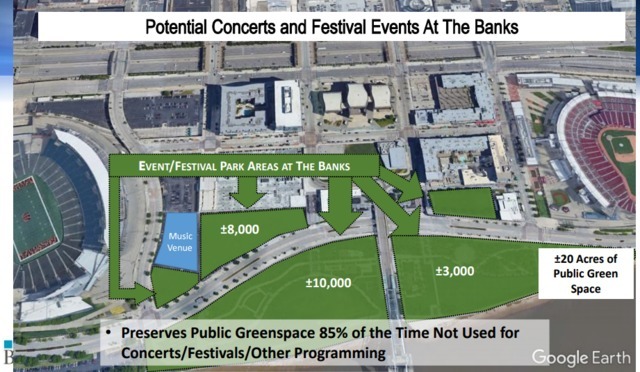 Joint Banks Steering Committee Chairman Bob Castellini said the city and county shouldn’t hire an outside company to construct a new concert venue at The Banks. Both PromoWest and Live Nation offered to build an indoor and outdoor concert venue. Meanwhile, the CSO has promised to construct an indoor facility and manage concerts at a temporary stage set up on city-funded park land. When asked, committee members said they don't know how much building and maintaining that park space will cost city taxpayers, or the parks system -- which has faced years of maintenance backlog. The Joint Banks Steering Committee’s vote Wednesday was just a recommendation. Cincinnati City Council and the Hamilton County Commission will have the final say on who gets to build on the riverfront. "I want to look at all of the different options that we have," Cincinnati Vice Mayor Christopher Smitherman said. "I definitely want to hear from the public. I want to hear what they think about it and then just represent them." Five members of the powerful committee were present for the vote. Four of them voted to recommend the CSO’s proposal to council and the commission, with Charlie Luken voting against the plan. The majority of the committee said they were impressed with the CSO’s plan to hire minority businesses to construct the venue and leave the Cincinnati Parks with roughly two acres of land to develop into more green space at The Banks. The fact that CSO is based in Cincinnati did not give the organization an edge with Steve Love. But others questioned how fair the process was and if the CSO was allowed to alter its bid after hearing feedback from the city’s politicians. Live Nation submitted a $66 million concert venue plan, and asked taxpayers to float $36 million for the project. He also said that building a parking garage for Cincinnati Symphony Orchestra’s smaller venue – which could hold as many as 4,000 people inside – will save the county millions of dollars. But Michael Belkin, the head of Live Nation’s Cleveland office, said the company was open to changing the bid. Committee member Charlie Luken said he received emails with new photos and proposals from the CSO just days before Wednesday’s vote. The changes, Luken pointed out, came after local leaders including Mayor John Cranley, Cincinnati Councilman Chris Seelbach and Hamilton County Commissioner Denise Driehaus said they favored a facility that features outdoor concerts. But Gabelman and Castellini said portrayals of the CSO’s bid as an indoor-only facility are misinformed. In a letter sent to The Banks committee Tuesday, Cranley said he worries the CSO’s bid focused on an indoor concert space and because the CSO is a nonprofit, the venue will be exempt from paying property, income and admission taxes. Castellini questioned that letter during Wednesday’s meeting. “John (Cranley) wrote a very all encompassing letter here but I feel like a lot of the facts are not correct.” Castellini said of the mayor’s email. Gabelman met Tuesday afternoon to discuss the concert venue development with the mayor. “In fairness to the mayor, I don’t think he has all the facts,” Gabelman said Wednesday. Steinecker said when he has built venues in other cities, including Pittsburgh and Columbus, he did not encounter the same pressure from Cincinnati leaders. “We always felt like we were fighting an uphill battle,” Steinecker said. He also questioned the legitimacy of the CSO’s plan to host 20 to 25 concerts a year on a temporary stage, adjacent the indoor facility. Setting up for weekend concerts like the Bunbury Music Festival take up to two weeks, he added. “Full-fledged concerts out there 25 times a year? I’d like to see it,” Steinecker said. Robert Rhein, however, said he was surprised by the CSO’s knowledge of the music industry, and confident they will bring the best acts to town. That spurred Belkin, of Live Nation, to interrupt Rhein. “It might be interesting to hear what some of the promoters who actually do this for a living, what they might think, rather than somebody’s child because everybody at this end of the table does this for a living,” Belkin said.